Musings about Motherhood, Marriage, Homeschool and LIFE. If you’re a mother, you get this. It’s very real. So real it’s tangible. Guilt that only mothers can have, get or put on themselves. Three years ago, I dutifully accompanied the Colombian princess to her first American dental appointment. After the x-rays and examination, the dentist handed me a sizeable Mother Guilt trophy explaining that her Colombian fillings were of poor quality and ALL needed to be replaced. She had multiple cavities that would need to be filled immediately and there was so much work necessary that we would have to take her to a pediatric specialist to put her under for the procedures. He had the nerve to ask if she brushed her teeth. He meant AT ALL! If nothing else, my little girl is diligent with personal care tasks. She is the most regular flosser in our house, I’ll have you know, Mr. 24-year-old not-shaving-yet white coat!! After listening to his entire money-hungry spiel, I inquired the location of the cavities. As I suspected, they were all on baby teeth AND they were all minor. With the referral slip in hand, I slipped out of the office and took the princess home to her father. Being fully versed in dental procedures and examinations, together her father and I ascertained that the Colombian fillings were just fine and we wiggled all the baby teeth with cavities. We noticed they all got more wiggly as we took turns wiggling them. Nope, not fixing them. This is a translation for those who aren’t mothers. This entire dental event had me swear off my motherly duties of dental visits. Period. I somehow forgot the six month check ups… for two years. It’s easy to block episodes that cause Mother Guilt. Finally, after almost all of her baby teeth had fallen out, I made an appointment for her with her FATHER to go back to that horrible place. Her appointment was this morning at 8:00. By 9:40 I had not heard from them and was envisioning my little Colombiana strapped in the reclined chair, wearing a bloodied paper bib with tears running down her little cheeks into her ears. Just then my husband called and relayed that they were at Denny’s having breakfast. He casually mentioned that she had NO CAVITIES! WHAT? 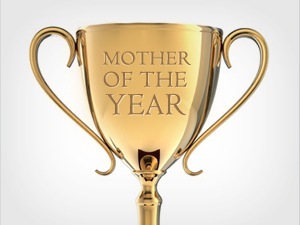 And I wasn’t there to receive my Mother of the Year trophy!!! When they got home, she reported that they put fluoride on her teeth and told her not to eat anything for 30 minutes, but that Daddy took her to Denny’s anyway. Nice! Father guilt doesn’t even exist! If her fluoride wore off with a Jr. Grand Slam, it is SOOO not this mama’s fault! 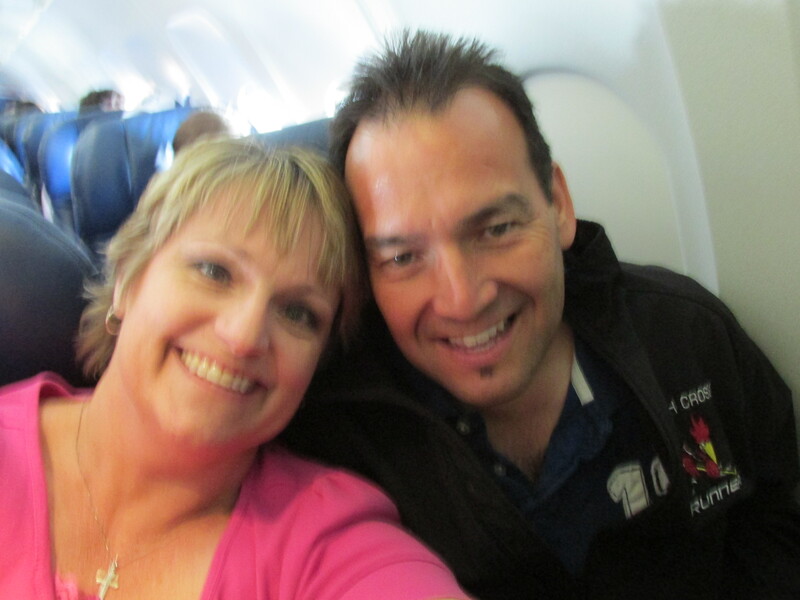 Yet another event-filled trip including airports, airplanes and mishap after mishap. It started with the suitcase being 62.5 lbs… 12.5 lbs OVER the weight limit. Do we want to pay $75 for 12.5 lbs.? NO! So the unzipping of said bulging suitcase and our two carry-on suitcases commenced. Followed by much shoving and re-weighing. Finally, we got it down to 49.5…. but the airport scale announced a .5 lb. gain on the drive to the airport. Whatev. On the drive to the airport in the dark of the early morning, I realized I neglected to adorn myself with my silver jewelry and my WATCH! I am going to be late ALL WEEK! Thankfully, a fellow glamor queen brought two and shared. When we got to the airport, I dug around and found replacement jewelry so I wasn’t naked. Whew! Next, you would have thought it was our first time traveling…. (and Rick is a pilot for Pete’s sake and heaven all mighty! )… We BOTH got pulled over at security. I left a water bottle in my purse. DUH! Rick left his wallet in his pocket for the full body scan. That didn’t go over well. AND he put the laptop in a conveyor belt bin WITH his belt and shoes. Uh… big time no no. Next, we had a blowout on the handle of the FAVORITE carry-on. No big deal, right? I mean, how much do you use the handle on the top of the small suitcase? Only every single time you try to move it up or down. Moving on. Airspeed indicator malfunction. That’s what our two hour delay sitting in the plane on the tarmac was caused by. My pilot-husband did confirm that whatever that indicator indicates is pretty important for flight safety, so we patiently and impatiently waited before our 4.5 hour flight. So, we landed two hours behind schedule, but not late enough to miss out on a Philly Cheese Steak sandwich in Philly. YO Adrian! The crack in THE bell, and all that jazz. Upon arrival at the Sandy Cove retreat center in North East, Maryland, I discovered that I left my favorite turquoise reading glasses in the seatback pocket on the airplane. That just plain made me said. Those were my favs. Yes, they were from the Dollar Store but STILL! My $10 manicure only lasted two days… and I didn’t even do any dishes. So it cost me another $2.95 and $2.85 to match the color and buy more top coat, turning the $10 manicure into a $16 manicure…. gah. #so.not.worth.it! But we arrived in Ellicott City, Maryland today to one of the biggest hotel rooms I have laid my eyeballs on in a looooong time. I even stole borrowed two chairs from the hall and we had a 7-man meeting in our plentifully spacious room. He shoots! He scores! It’s a Mother’s Day CONTEST!!!! Come one. Come all. Step right up and enter to win a GRAND PRIZE for you or a mother dear to your heart this Mother’s Day. Maybe something to bring joy to her heart. Something to make her laugh…. and snort… and laugh some more! Yes, you guessed it! A Book! YES! 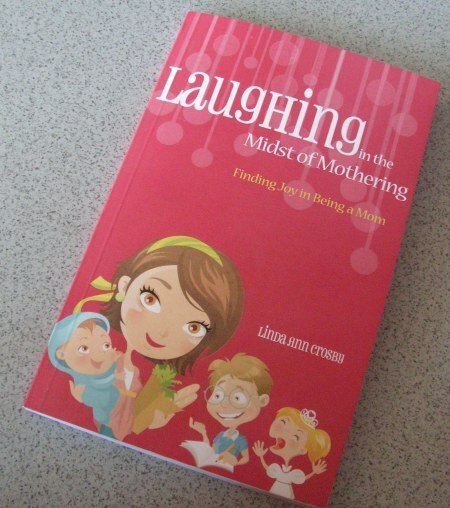 Yes, a FREE autographed copy of my book Laughing in the Midst of Mothering! Every mother you know needs a laugh! This book can be yours (for your mom if you aren’t a mom) by merely entering your name in the comments section of this blog. I’m thankful that I am still here to write a blog for your reading pleasure. The airbags did their duty, probably a bit more intensely than required at 35 mph, yet I am trying to keep a sense of humor in the midst of it all. Please excuse any humor that may seem off color in our circumstances. Remember also I am currently using narcotics. My cute husband and I were enjoying a moment of peace and tranquility on the back patio yesterday morning, holding hands and loving the balmy Phoenix weather in March. He squeezed my hand and conveyed a heartfelt, “I’m so glad the accident was not that bad. I could have been going to two funerals this week!” BAH! I told him that his sentiments were kind but I knew he was WAY too cheap to pay for two funerals…. there would have been just one. This morning I visited the spinal surgeon. He had good news and bad news for me… but the good news outweighed the bad by 98%. I am not free to discuss my injuries to the world at large, but spinal surgery was negated. Thank God! Then he proceeded to tell me that my spinal condition is appropriately degenerated FOR MY AGE. What the heck was that supposed to mean? I’m in my 40s!! If he were a car salesman, this was the equivalent of kicking the tires and saying, “She’s got a few more miles in her despite the apparent neglect.” Good grief! It has been 11 days since the accident and today was the first day I had a surge of energy and applied makeup! Small steps. It was my fourth or fifth visit to the chiropractor since the accident. As I graced the waiting room the receptionist hollers, “OH MY GOSH! You look so much better today!” Yeah, thanks. It’s just makeup. I feel the same… still sore, achy and drugged. My Dad always said, “If the barn needs painting, paint it!” I gathered from her exuberance that my natural beauty was more in my mind than in reality. I arrived home exhausted from more outings than my typical one-per-day. While sitting at the table eating another wonderfully fabulous dinner that was delivered to us by our rockin’ homeschool peeps, my 9-year-old says to me, “I like your hair.” Okay, seriously? It is a day #2 hairdo with the back completely oily from a massage, and one flat side from my nap. She kept going with her sincere flattery, “It makes you look like a teenager, Mom. It’s pretty the way it’s not all puffy like usual.” Wow. What do you say to that? By day of recovery #5 I finally felt like reading. I read four whole pages of the 1850’s historical fiction of which I was in the midst…. during days 6, 7 and 8. Yes, only four pages. Then day #9 my reading juices were regenerated and I finished the book. It was the last 1850’s historical novel I had in my possession and I was still on the couch for the better part of the day. CRISIS! I perused my bookshelves and discovered several stories that we were supposed to read for American History last year. Yesterday and today I read Farewell to Manzanar a biography/history lesson about an internment camp during WW2 for 10,000 Japanese Americans on the eastern side of the Sierra Nevadas in California. Every summer when we drive to Lake Tahoe, we pass right by the historical marker sign that reads <—– MANZANAR. Being the history loving nerd that I am, the desire to stop has surfaced every single time we pass the sign, but we have yet to stop. Now that I’ve read the story…. we are stopping, baby. 10,000 American citizens who were considered dangerous simply by race… put in a “camp” like prisoners for THREE YEARS! Unbelievable. I’ve added this story here because I was hoping to see barracks, a mess haul, latrines, a pear orchard, etc. The end of the book describes Manzanar today as a dusty, deserted piece of land with a few cement slabs if you know where to look for them. Maybe I don’t need to stop as badly as I thought I had for the last 12 years. We’ll see this summer. When you grow up, you assume your life is the normal life of all the other kids in the world. When you get older, you realize just how non-normal your growing up actually was, well, compared to all the other non-normal lives you learn about as time goes on. Confused yet? All that to say, I grew up thinking everyone dreams in color. I do. Of course I’m not the weird one, am I? Thanks to the internet, I have discovered that more than 80% of people dream in color. Not so weird after all, thankyouverymuch. Yet another fact caused me to pause and consider my abnormalness once again…. 95-99% of people forget their dreams. What? Almost every night I have vivid dreams and can tell the tales of them the next day. My children take great pleasure in asking me what I dreamt last night and then rolling on the floor holding their sides due to laughter induced dream tales. Some dreams have stuck with me for years… for 24 years, in one case… like it was yesterday. Some are so real that I write them down to ponder later. While we were away at Christmas I had this great dream (that my children loved) about my husband wanting to redo the greenhouse (that we don’t have) on the back of the house (that we don’t live in). He was all inspired and wanted to show me his plans, but he insisted the best view was from the neighbor’s back driveway. The only glitch was that he was naked and I wasn’t walking outside with him. I’m the modest one in the family, for goodness sakes alive, even in my dreams. So he talked me into driving over to the neighbor’s back driveway in our station wagon with tasteful “wood” paneling on the sides. He drove me over there and proceeded to do a 13 point turn in the little driveway until the car was facing our greenhouse (sideways on the driveway.) But the inevitable happened and he backed up too far and we went down into the ditch and got stuck. I told him I would climb out the window and go call AAA but he yelled, “You cannot call Triple A, I’m naked!” And that was the end. I did not find deep meaning in that dream. I pray we never own that house or car! But it WAS funny! Sixteen years ago, after watching Father of the Bride 2, my husband decided we should move from Spruce Grove, Alberta to Phoenix, Arizona to be near my parents. I whole heartily agreed. 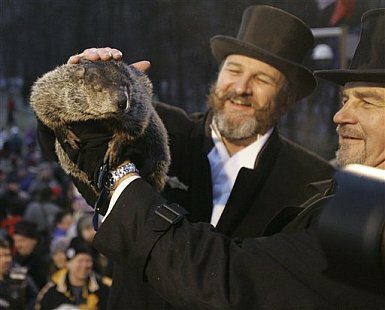 We put the house on the market and prayed for a quick sale, it was winter after all. Then I had a dream about a lady coming to buy our house. I awoke quite relieved and explained in detail what she looked like to my husband. For ten long months, our house sat on the market and many people came to see it. Every time I opened the front door, if it wasn’t the lady in my dream, I was disappointed. Phoenix was calling my name, after all. Finally one day she came. I recognized her. And she did buy our house. Truly, I think God gave me the picture of her as a sign of hope that there was someone coming. It gave me a measure of assurance. Do you remember your dreams? When my children were 7, 4 and 2-years-old (back when I only had three kids!) I read a book that stated, “A seven-year-old is capable of running a household.” It shocked me. But I bit into it…. with my jaws wide open… similar to my first bite of a Krispy Kreme donut. That night, as I laid in bed with my eyes wide open, I dreamed of training my 7-year-old to take over all the menial tasks that I dreaded as a mother and keeper of the home. I envisioned my next two offspring also reaching the ripe old age of seven…. and helping their older sister do EVERYTHING! Oh, sweet baby Jesus, this was the answer I needed … my ticket to sanity… the train bound for the hot bubbly bath surrounded by candles …. and TIME to read a good book without interruptions. The chore chart was born that night and materialized the next day. It worked like a gem. I taught each kid a single chore, one at a time, year by year, that they could master at my cleaning expectations. Oh, would my future daughters-in-law sing praises to my name! Discussions revolving around teens and the spirit of helping, a willingness to serve, desiring to be like Jesus, etc. etc. etc. were had by yours truly and many others in my life. Since then, we have regrouped and are trying something new and improved… it’s called being nice. Being thankful. Not feeling entitled. An announcement was made at the dinner table not long ago…. it went something like this: “We are a family. We help each other. We serve each other. If someone cared enough to plan your meals, go grocery shopping, cook for you and set the table….. then you need to stick around until the whole kitchen is cleaned up and the food is put away.” BAM! It has worked beautifully for three nights now. I will keep you posted on the success of trying to teach my children to be helpful without their name written on a chart. Pray for me. Now, those who have great faith in my chore chart abilities, do not fear. Only the kitchen tasks have been removed. Their names are still next to chores that include wiping toilets, vacuuming, dusting, cleaning windows, collecting trash, etc. etc. etc. Some things just need routine. Ok, I just need routine…. and a long bubbly bath surrounded by candles. Last Night was a GAS…. the good kind. We drove and drove and drove out to Surprise, AZ to see Tim Hawkins at Radiant Church. It was supremely HiLaRiOus! Oh, my tummy is tender this morning from laughing so hard last night. A couple weeks ago, I saw him perform at the D6 conference, so a lot of the material was the same…. it’s just so stinkin’ funny even the second time around. One new topic he brought up that just made us split a gut was GAMES… of today and yesterday. He talked about his kids having all kinds of electronic stuff… and what did we have? Nothing! Each other! Remember the game “Stare at the lightbulb”… and then closing your eyes for your own light show in your head. I’m not even sure if my kids know you can do that? I’ve not heard the extent of his guitar abilities until last night, and he is simply amazing. Wow! Anyway, if he’s in your area, GO SEE HIM! And if he’s not, watch all his videos on youtube. 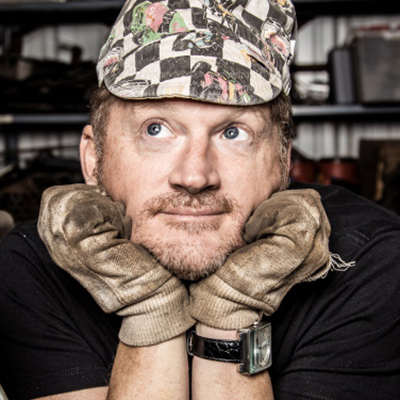 We’ve spent many a Tim Hawkins family night in front of the computer screen. Good, clean, rich humor. Five out of five stars. What’s the Deal with the Jar? Welcome to My Sister's Jar. The story behind the blog lies in the original post on Feb. 2, 2008. Type "giddy moments" into the search box to find it. I'm a homeschool mom who loves to speak and write, encouraging moms to press-on in motherhood. Two of my books are available NOW! Laughing in the Midst of Mothering and Laughing in the Midst of Marriage. See them at www.LindaCrosby.com or www.cbd.com. I have four children, one of whom is adopted from Colombia, so there are LOTS of adoption tidbits here. THE Bun Recipe.... you're welcome!